The Gazprom Board of Directors commended the company for the progress made on its major investment projects. It was noted that Gazprom’s projects were strategically important for Russia’s energy security. The projects make gas supplies to domestic and foreign consumers more reliable and create conditions for further strengthening the company’s position in the global energy market. All of Gazprom’s priority projects are on schedule. Gazprom takes extensive efforts in eastern Russia as part of the eastern gas programme. Specifically, the company continues to construct the Power of Siberia gas trunkline, which will deliver gas from the Yakutia and Irkutsk gas production centers to Russia’s Far East and China. 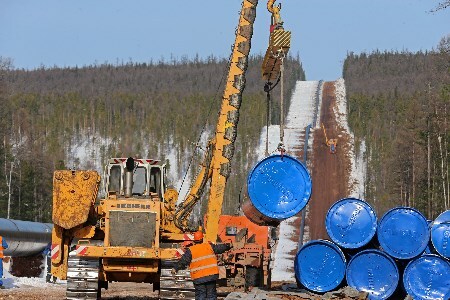 Construction and installation is underway along the pipeline’s priority section stretching from the Chayandinskoye field (Yakutia) to the Russian-Chinese border (near Blagoveshchensk). As of the end of February, over 500 km of the linear part have been built. The crossing under the Amur River within Power of Siberia’s cross-border section entered construction. The predevelopment of the Chayandinskoye field – the basis for the Yakutia gas production center – continues, with 40 new wells drilled in 2016 and works underway at the sites for comprehensive oil and gas treatment units. The construction of Russia’s largest gas processing plant – the Amur GPP – is in full swing. The plant will recover valuable components for the petrochemical industry from natural gas delivered from the Yakutia and Irkutsk gas production centers. At present, the company carries out preparations at the site for the process facilities of the GPP’s first start-up complex and builds a river berth and the railway infrastructure. Gazprom's main resource base shifts further northward. The company makes comprehensive efforts to develop the gas production centre in Yamal and to expand the northern gas transmission corridor that reshapes the geography of gas flows for both domestic supplies to European Russia and exports. The company builds up its production capacities at Bovanenkovskoye, the largest field in the peninsula. There are two gas production facilities successfully operating at the field. With two booster compressor stations and new wells put onstream in 2016, the field reached a new peak in its output, producing 264 million m3/d of gas. It is planned to bring in operation one more booster compressor station in 2017. With a third gas production facility, which is currently under construction, the field will reach its design production level of 115 billion m3/yr of gas. The Bovanenkovo-Ukhta 2 gas pipeline running for about 1260 km entered operation in January 2017. The construction of the Ukhta-Torzhok 2 gas pipeline is underway: it is planned to commission some 500 km of its 970 km long linear part this year. Another ongoing project provides for the expansion of gas transmission capacities in northwestern Russia within the area between Gryazovets and the Gulf of Finland. The modern and highly efficient gas pipelines of the northern corridor form part of a new route for Russian gas exports to the European market, namely the Nord Stream 2 gas pipeline. The route from Yamal to northwestern Europe across the Baltic Sea is the shortest, most reliable and efficient export channel. The Nord Stream 2 project proceeds as planned, with both strings expected to enter service in the fourth quarter of 2019. Active efforts are taken to construct the TurkStream gas pipeline across the Black Sea, a project aimed at ensuring reliable transit-free exports of Russian gas to southern and southeastern Europe. On 1 March, Gazprom received a number of permits for the project from the Turkish authorities. The contracts to build two strings of the TurkStream gas pipeline’s offshore section were signed. Construction is scheduled to start in the second half of 2017. Gazprom's priority objective is to ensure reliable gas supplies to Russian consumers during demand peaks in winter. The company therefore consistently increases the deliverability of underground gas storage (UGS) facilities in Russia. Gazprom pays great attention to gas supplies in the Kaliningrad Region. The company works to expand the Kaliningradskoye UGS facility and constructs an LNG regasification terminal scheduled for commissioning in 2017. The Gazprom Management Committee was instructed to continue delivering the company’s major investment projects.